It is a familiar pattern. It has happened before. Around 10am on Memorial Day, my iPhone can be vibrating with email signals as I was driving one of my children and her friends. Soon they were coming in fast succession and then I knew: The President has tweeted out a quote. The two tweets were followed by a torrent of threats, insults, and profane suggestions involving physical acts that would have been challenging in my teens. In today’s rage-filled environment, the mere fact that Trump quotes you unleashes a tsunami of anger. It seems cathartic for people who cannot tolerate the slightest hint of agreement with Trump. The same is often true on the opposite end of the political spectrum if you challenge or question a position of Trump. What is interesting is that people who seek out your email almost uniformly do not take the time to actually read your comments. Yet, what is most disturbing is not the endless cranks but the coverage by news sites that show the same lack of interest in the actual comments or even the tweets themselves. President Trump tweeted two quotes from a morning interview that I gave on Fox News about the call for an investigation into allegations of FBI misconduct in the use of an informant targeting Trump officials. The interview also discussed critical comments made by former Deputy Attorney General Sally Yates, whom Trump fired last year. In the interview, I stated that there was a legitimate concern raised about the Obama Administration carrying out an investigation of the opposing party’s presidential campaign. I said that it is not clear that anything will come of the investigation but that the public deserves to see both the investigation of the Trump campaign and the investigation of the FBI completed. I was critical of both the efforts to derail the Russian investigation and the FBI investigation by people on both sides. When asked about Yates, I agreed with her that Trump went about this in the wrong way. However, I noted that I have been highly critical of her actions as acting Attorney General. I have previously discussed the ethical and professional problems surrounding Yates’ order for the Justice Department to stand down from defending the Travel Ban. As discussed in a column today in the Hill newspaper, Yates is hardly a compelling source for protecting the established lines of authority between the White House and the Justice Department. The discussion of the interview focused on Yates’ actions as Attorney General in questioning whether she is credible in raising such issues of maintaining long-standing lines of authority. The tweets also clearly referred to her actions as Attorney General and, rather than relating them “Spygate”, referenced the concerns over bias at the Department. There was no blaming of Yates for Spygate. I was also accused of repeatedly promoting “the phony theory that the Obama administration surveilled the Trump campaign ‘for political purposes. '” However, I have always stated that I have no expectations of any finding of wrongdoing in the FBI investigation. Instead, I have said that there is a legitimate concern that should be addressed with a full and independent report not only for the benefit of the public but the Justice Department itself. I believe that all of the these officials should give accounts as part of a comprehensive record from both Congress and the independent investigations by Mueller and the IG. All of this because the President tweeted a couple of quotes. It is a reflection of the distemper that has taken over our public discourse. It is no longer possible to recognize that the President can have a legitimate concern or the value of resolving such questions in an investigation by career lawyers. There seems to be an ever shrinking space for good-faith discussions. To say anything deemed supportive of one side or another is deemed an act of duplicity or deceit. Whether it is MCNBC or CNN or Fox or countless websites, people look for echo-chambers that continually reinforce their bias. be speaking Russian too” I am a “deep state guy” simply because I believe that there is a legitimate concern when an Administration uses national security powers to investigate officials in an presidential campaign of the opposing party. If George W. Bush’s Administration had investigated Obama figures through FISA, would the response from these people be the same? I doubt it. My complaint is not with the angry messages. That is like complaining about the weather for commentators and columnists. Rather I am truly concerned about our chances as a nation to emerge from this environment with an semblance of unity. There is little chance that we can resolve our divisions in this increasing polarized environment. That is why it is so important that the public (or at least those still interested in the truth) to demand both investigations continue unimpeded and a full public disclosure made by the government. “The Scream” by Edvard Munch is the wrong illustration for the thread but not for anyone reading the comments; beware! The Clinton/Obama/Rino Pissgate/Spygate, starts say 40 mins in & work backward if necessary. I love TYT breaking down – that fake Progressive media site. Only sane person is Jimmy Dore who is NOT freaking out – he saw it coming after the DNC screwed Bernie. .
Squeeky Fromm would strongly benefit by reading about the anthropology of Africa. David Benson still owes me two citations, one from the OED. David, you benefit greatly from getting me my two citations. I owe you precisely nothing. Darren, how longer do I have to put up with this trite repetition? anonymous – it appears you are squandering our time. Another foolish twist by PCS, with the assumption of “our time” being wasted. The man can”t cite; can”t argue; can”t offer any worth beyond his illusions of Annie/Inga. PCS likes kicking dead horses in the hope it is seen as brilliance..
R. Lien – you missed the point of that sentence since it was not to you. It was a quip meant for someone else. Two things I know about humor: 1) taste is personal 2) not everyone is smart enough to get the joke. Poor PCS has OED and Annie/Inga on the brain. He has accused L4D of being Annie/Inga for a very long time now. It is so obvious that this is not the case as Annie/Inga most likely would not be able to author what L4D posts. It shows poor assessment skill on PCS’ part; but fools never change, they just carry on not noticing that they’re being a fool. Much like the the repetitious dribble thrown at Benson for citations. PCS rarely cites anything; he thinks his thoughts are irrefutable. Dandy little quips he has, too. R, Lien – what proof do you have that L4D is not Annie/Inga? How easily the question is turned around by a fool. R. Lien – still not answering the question. BTW, being the fool was a good position at the court, the only person who could tell truth to power and still survive. Great perqs. For instance, R Lien has no proof that Paul Caviler Schulte is not Annie/Inga, either. L4D is enabling David Benson There is plenty of proof that I am not Annie/Inga. I was one of the ones who exposed her many sock puppets when she decided to have 27 sock puppets. Since Darren had her IP address, it was not the same as mine. And I think Annie/Inga was banished for a while. I have not been banished. Mr. Smith has L4D’s IP address, it is not the same as Annie/Inga’s. L4D has not been banished. If L4D had 27 sock puppets, then they would all read exactly like L4D. P. S. Do you have any proof that Annie/Inga is not still banished? L4D is enabling David Benson You appeared about the time I heard that Annie/Inga might be back. Plus you link the same way she does and you are as incoherent as she is. This is all assuming she is still alive. Squeeky is the one who told you that she thought that L4D might be Annie/Inga just a few months ago. I showed up here in July of 2017–long before Squeeky told you that she thought that L4D might be Annie/Inga. Does there even exist such a thing as a linking style? Can you describe it? Or explain how a putative linking style might refute a demonstrable writing style? Or are those questions too incoherent for you? P. S. If you are assuming that L4D is Annie/Inga, then you are necessarily assuming that Annie/Inga is still alive. Or else you are assuming that you are corresponding with a deceased L4D. Are you merely pretending to be a nimrod? L4D, The confusion occurs because too many people change their aliases. You were Diane at that time. L4D is enabling David Benson Linguistic forensics is how they caught the Unabomber. For instance, I was at an art talk a couple of months ago and the lecturer threw up a painting on the screen. I immediately knew who the artist was, it took me a moment to decide which of two periods it was from. All that was based on what I could see on the canvas. After looking at thousands of student papers you get so you can identify each student’s style. Now you will forget them the next semester, but when they are in your classroom you know if they are doing their own work or not. In this case, I thought you might be Annie/Inga because of stylistic commonalities. I am now undecided. As you can see I have gone back to calling you L4D. It would be dishonest of me to accuse you of something that you were not. Not that being Annie/Inga is a bad thing. Just if you are not her, I am sure you do not want to be confused with her. The confusion occurs because PCS is obsessed with Annie/inga coupled with the fact that PCS can’t discern between writing styles any better than he can discern between a hole in the ground and the one he carries with him. L4D is enabling David Benson – could you expand on this. You have completely lost me. He who demands that others should prove a negative necessarily forfeits the claim that one cannot prove a negative. It is only those who shoulder the burden of proving a negative who can shift that burden onto the shoulders of others. See: Russell’s Teapot. L4D is enabling David Benson Russell’s Teapot deals with religion or philosophical issues. I am talking about getting two citations that should exist because David Benson said they existed. Your citations from Dr. Benson are located in Russell’s Teapot along with Annie/Inga. Russell’s Teapot distinguishes formally untestable hypotheses from hypotheses that are testable only under ludicrous extremes of empirical inquiry. If the teapot fits; steep in it. Lien is another of her aliases. Darren Smith needs to put her on a time-out. Lien is another of her aliases. In the immortal word of Benson: Yup. Olly and Nutchab spouting more nonsense. No one is asking Mr. Smith to tweak Turley’s spam filter again. L4D was sad and lonely the whole time Nii was on sabbatical. Please sing us one of the old songs, Nii. Like my favorite: “Judicial Ukase Cohorts and Their Anodyne Feelz.” Please? Y’all are way, way off base. D. Lien — Paul C Schulte needs some mental health counseling. He grows madder by the month. David Benson owes me two citations, one from the OED. Who is madder, the one who wants the citation or the one who refuses to back up their claim? The one who beats a dead horse. Just waiting to be deleted by Professor’s Turley’s Standards & Decency Department. IMHO, if it was such an absurd comparison, no one would be angry about it. But, to tell the truth, there is a resemblance between some black people and various primates. I guess it is the dark skin and the frizzy hair. I am not trying to be rude here, but that is just the unfortunate facts of life for black people, that some of them look like monkeys. That being said, I am not one who usually teases people about their innate physical appearances, because that is something a person can not help. I find that unfair. It is a different story for me though when it comes to behavior, for example, where the grunting, hooting, and high pitched squeal sounds that black women and girls make during combat and other disputes, such as quarreling at Chuck E Cheese’s, does indeed sound like chimps. Thus I think “chimpout” is a valid term to describe the behavior. And other monkey-ish black behavior. 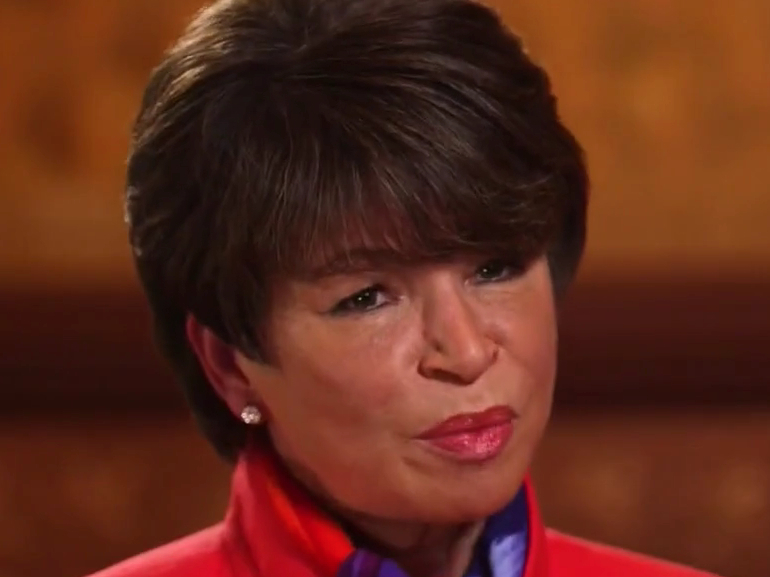 I think Roseanne was rude in her comment, and that she should have apologized, because Valerie Jarrett can not help looking like one of the inhabitants of the Ape Planet. And that is taking a cheap and unfair shot at her. But, I don’t think Roseanne should have been fired for it, as long as she apologized. 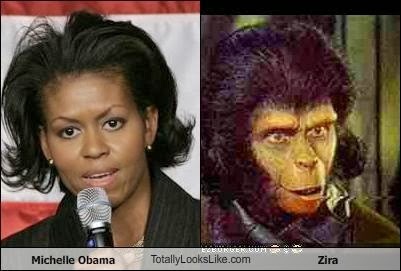 Squeeky, Michelle Obama doesn’t look like the actors in Planet of the Apes. She’s perfectly pleasant looking and the insults directed at her are puerile and gratuitous. No, blacks do not look like primates and the only thing which suggests it is the broadened nose, which is commonly absent and which Michelle and her daughters do no have. Whether or not some blacks look like primates is a matter of opinion. Heck, even some white people look like Neanderthals, IMO. Sometimes, it is just a matter of which photos are used. I agree with you that teasing black people about their looks is puerile and gratuitous. Because God made them that way, and they can’t help it. Now, if they start acting like monkeys, then that is another thing altogether. To my knowledge, Michelle Obama has never acted that way, and the only thing I fault her for is some of her political stances. Although, the “caboose” photo of her and the sleek European leaders’ wives was kinda funny. The two Ferrari’s and a dump truck one. There’s a two-fer-one white sale down to the piggly-wiggly. You can always make use of another pillowcase when you mess up the eyehole cutouts. Michelle Obama is a beautiful, athletic, well-educated woman. I took issue with her policy of school lunches, which led to kids going hungry and forces schools to serve only low fat milk, even when a child needs to maintain weight and not lose any. As well there was that “cling to their guns and religion” snafu. I also am disappointed that the Obamas departed from tradition and condemn the current Administration. There is a long history of former First Ladies, especially, being very loyal and supportive of each other, for the most part. Bush left a very kind letter to Obama regarding the job. Looks are immaterial, and in any case, she looks lovely. Even if I did not find her attractive or in shape, I could care less. It is her actions and policies that matter. Racists thought that blacks were more closely related to apes than whites, that they were a separate species. That is emphatically wrong. Skin color and hair variation is a tiny infinitesimal fraction of our DNA, and we are all brothers and sisters of the same family tree of humanity. Comparing any black person to an ape is racist. Comparing a white person to a Neanderthal is not racist, but rather a slur on looks, because white people were not thought of as a subhuman species for hundreds of years. I find other differences far more interesting than race – interests, hobbies, talents, prejudices (my own is against Monsanto), education, work ethic, character… Dr. Jordan Peterson said that there is far more variety within ethnic groups rather than between ethnic groups. I tend to agree. “White woman” says very little about me. Sorry, but we disagree on this. My question is, is saying a particular black person looks like a monkey necessarily a racist statement or could it just a crude/mean statement? I think it is a factual question, and if the particular black does indeed favor a monkey, then I hold open the door to it just being a mean thing to say. And sadly I guess, with the dark skin and hair characteristics, there are just some blacks who really do favor various primates. I think it is childish to tease them about this, and cruel, but not necessarily racist. What about calling a woman a fat cow? Is the woman fat? If so, then to call her a fat cow is descriptive, if not very nice. What about a person with big ears? Dumbo. People with big noses. Pinocchio. Or Cyranose de Bergerac. I mean there are some really hideous looking people in the world, and I feel sorry for them for the fun that is made of them. Because that is not something somebody can help. White people get called names all the time for their physical characteristics, things over which they have no control. Heck, my real true nickname in real life is “Squeeky” because of my voice. Is it mean, or just descriptive? Or a little bit of both. I don’t think it is anti-woman to call me Squeeky. My point is, that some people who automatically jump to blacks being described as monkeys a racist thing, are maybe probably protesting too much, because the description is often just too accurate. Dumbo, Cyrano, cow…those are all mean and wrong, but they do not have the same context as the genetic race theory that justified discriminatory practices towards blacks for years. Blacks were considered sub-human because if they were acknowledged to have the same humanity as whites, it would lead to the inescapable conclusion that slavery and, later, Jim Crow laws, were evil. There was a man who was fired for mocking a black janitor. He said she was “picking cotton.” He was justifiably fired. (Again, this is applicable to the NFL protest movement regarding speech in the workplace.) An Asian co-worker who had immigrated here fairly recently was horrified. She asked later if agricultural references were a fireable offense, and was terrified that she might say something that got her fired. The slavery reference went right over her head and had to be explained to her. In Asia, or other countries, perhaps such a reference would neither be intended more interpreted as racist. But in America, it most emphatically is. Whether or not Roseanne intended for her statement to be construed as racist, her comments are interpreted in the context of our culture. Our culture clearly associates black comparisons with apes as racist. If she did not mean any racism, then that is unfortunate, but still bad judgement. I do not know much about Roseanne at all, so have absolutely no idea if she is racist. I call children going wild a barrel of monkeys, including my own child. No racism intended. But I would never apply such a statement to a group of black men. Come to think of it, I would probably automatically joke about kids going bananas like a barrel of monkeys whether the group was mixed or not, without race even on my mind. I would be horrified if such an off the cuff remark was taken as racist. So I can see how someone can inadvertently step in it. But describing a black woman as looking like an ape is at the very least a pretty obvious faux pas, if not blatantly racist remark. The Democratic Party has claimed for years that the Republican Party is racist and evil. It has tried to disassociate itself from its own virulently racist roots and tried to tie them around their political opponents’ necks in order to get votes. Oppose our policies? Racist. Welfare work requirements? Racist. And so, there is a higher standard, fair or not, to which Republicans have to adhere or else the Democrats will say, see, they are all racist. All of Liberal Hollywood could cycle through the disgustingly stained casting couch, but if a single Republican abuses women, it becomes a cloud over all Republicans. It doesn’t matter if it’s fair or not. It’s reality. When Roseanne Tweeted such an offensive Tweet, she caused exponentially more damage to the conservative movement than would ever have happened had it been some Liberal. Democrats take each and every instance of wrongdoing as an aspersion to cast on the entire conservative movement, while Liberal malfeasance is casually brushed aside as an individual problem. I am amazed at the holier than thou attitude of Hollywood towards misogyny when actresses themselves have been complicit in using the abusive policies towards women to either advance their own careers, look the other way so that they can work with famous producers, or even enable to go with the flow. How many women took unsuspecting naive victims up to Harvey Weinstein’s hotel rooms, or directed them where to go, knowing full well he was going to demand that they pay to play? How many stayed silent? This is not just a “man problem”. There are many women who participate fully in this system, even using it to their advantage. (Think of Bowfinger in which Heather Graham slept with anyone and everyone she could use to advance her career. Unfortunately, one is often judged by whom they travel with. A broad brush covers all the wood. She did apologize, but apologies only work for liberals. They’re not accepted from conservatives. Yep. It was rude, but Liberals tease people all the time about how they look, and get away with it. Just a case of double standards. Google Trump Orangatang. Or Bush Chimp. FFS – I was disappointed in Roseanne’s Tweet. I had not watched her show yet, but wanted to. She was the agent of her own demise. Even if she was just trying to be funny, she’s old enough to know better than to make any comparisons between black people and apes. Doing so with a white person would not have the same connotation. Regardless, I dislike cruel humor. I can’t stand watching a roast. Obviously, I never was able to stomach Kathy Griffin, and I also cringed when I watched Red Carpet snark fests. This is a very good illustration of why I feel, as an employer, that employees do not have the right to engage in political demonstrations or voice all of their opinions in the workplace. If their private behavior in some way materially damages their employer’s reputation or bottom line, then that can and should impact their employment. I do not know if she intended this as a racist statement, or if she is actually racist. I do not know much about her at all. It was an offensive statement. I wonder if those agitating against the NFL would support Roseanne’s freedom of speech and protect her from employment consequences? Do they consider this a constitutional crisis? I defer to Professor Turley and the other legal eagles on this site and accept the proposition that the NFL players as employees are not protected on the field by the first amendment. I find your comparison to be outrageous. The NFL players were protesting unjustified shootings. Roseanne, by her own admission, allowed a drug induced stupor to induce her to make an ugly and totally unjustified remark. Certainly, as a private citizen she has the right of free speech but ABC has same right to consider its business interests as does the NFL. There were no unjustified shootings according to the juries that heard all the evidence and as such the protests were built on lies. If a republican administration had investigated Russians in a Democratic campaign, I have no doubt that every republican would call for a special investigation to see if Democrats were involved in Russia, and you’d all have no problem with a special investigation by Mueller. You are all hypocrites, and traitors to America. So we’re expected to answer for something which never happened. The only notable investigation of ‘Democrats’ by ‘Republicans’ in re federal politics was the Whitewater matter. At that time, four prominent Democrats were convicted of species of fraud (one of the four also did time for contempt of court). All four fraud convictions had been secured by May of 1996, or 28 months after the investigation began. Quite brisk by the standards of the McCabe / Mueller snark hunt, which has been ongoing for 22 months without ever delineating for our edification just what the crime was. You are all hypocrites, and traitors to America. I have no doubt had the Obama administration actually been investigating Russians in our last election cycle, he would have instructed his agencies to notify those that were vulnerable (targets) of the Russian meddling. No, instead he enabled his agencies to create an insurance policy in the unlikely event the opposition party’s candidate ever became a threat to their party winning the election. Yeah, I have no doubt your wish-casting the Republicans as hypocrites somehow absolves you and your ilk of such a traitorous conspiracy; it ain’t working. Own it! Except there’s one tiny flaw in this theory: They never sprang the October surprise. The FBI kept a tight lid on the investigation — so tight, in fact, they floated a misleading story in the New York Times conveying the false impression that they saw no ties to Russia. Clinton did help finance Christopher Steele’s investigation, but also did not publish his reporting. And the Obama administration also kept a tight lid on the disturbing details that emerged. The farthest Obama went was to ask leaders of both parties to join in a bipartisan statement warning Russia not to interfere with the election — and when Mitch McConnell refused, they did nothing. When voting took place in November 2016, as far as the public was concerned, Clinton had been under FBI investigation and Trump had not. This alleged secret plan to smear Trump only works if you actually let people know about it. It’s kind of like the Doomsday Machine in Dr. Strangelove. Steele, with the knowledge and encourgement of Fusion’s Glenn Simpson, approached the Washington Post, the New York Times, and other publications with allegations from the dossier; this was done prior to the 2016 election. Established publications would not print the unsubstantiaed opposition research from the dossier, although Mother Jones did cover dossier allegations at the end of October, 2016. It may well be true that “Clinton did not publish his reporting”….there was no real need for Hillary herself to do so when Steele is out there hawking a DNC/ Hillary Campaign financed dossier story to the media. It’s not known if those in the DNC and the Hillary campaign were directly or indirectly coordinating with Simpson and Steele to get the dossier allegations published. President Obama (former) and AG Eric Holder and Hillary Clinton were NOT charged for all their crimes (“Fast and Furious”; Clinton for Benghazi, the Illegal use of a private server for storing CLASSIFIED information, etc). Were they investigated? “Fast and Furious” never was. The order to “stand down” on Project Cassandra also was never looked into because it happened only to save the Iran deal, aka “Obama’s legacy”. The Republicans would NEVER have gotten away with what the prior administration did. Clinton and Obama were cleared from the Benghazi affair and Hillary was never prosecuted for her misuse of classified e-mails. Don’t rant on about “hypocrisy”. The prior administration invented hypocrisy. That’s one opinion. Another is that you’re a mouth-breathing scum whose parents wish would move out already, since it’s been eight years since you dropped out of high school. Pro tip: get a skill, even gullible rubes, dupes and morons can learn how to mow lawns or wash cars. Marky Mark Mark – how are your online friends? Or your felon friends. the ones who have ended up in prison? You do have a limited circle. this whole surveillance of the trump campaign is a hundred times worse than watergate. the big difference is the target of surveillance and disruption actually won. One large difference being a FISA Judge authorized the surveillance. There was credible evidence that the Russians were attempting to interfere in an American election and it was the FBI’s proper role to investigate it. it was the FBI’s proper role to investigate it. That’s true. But what credible evidence was provided to FISC to secure the authorization? What is the likelihood the court would have authorized the surveillance had the FBI done a forensic analysis of the DNC computer hacking and discovered it was an inside job? What is the likelihood the court would have authorized it being fully briefed about the DNC/Clinton campaign financing the dossier? If you even checked with reputable news sources, you would know that the dossier was not the main source of the probable cause affidavit in support of the FISA warrant. you would know that the dossier was not the main source of the probable cause affidavit in support of the FISA warrant. Reading comprehension isn’t your strong suit. Good luck. Marky Mark Mark – according to one very reputable source there would be NO FISA warrant without the Steele Dossier. I think that was Brennan. The NYT and WaPo are spinning like tops to cover for the DOJ and the FBI because they are in it up to their eyeballs. Reputable doesn’t seem to be a term of much value anymore. We don’t know what evidence convinced the FISA Judge to authorize the surveillance. We don’t even know if the dossier played a significant part of the Judge’s decision. You can speculate on that all you want, but, to me that’s a waste of your time. But it’s your time so feel free. You stated there was credible evidence; I asked you what that evidence was. If we don’t know what evidence convinced the FISA judge, then how do we know any of it was credible? Because the judge gave the authorization? That doesn’t mean anything other than the evidence was convincing. We do know the DNC claimed their computers were hacked by the Russians, right? Did the FBI get access to those servers and confirm the source of the hacking? Wouldn’t that be a very important thing to know if the FBI was going to request authorization to conduct surveillance regarding collusion with the Russians by people associated with the Trump campaign? Add to that a dossier paid for by the DNC and Clinton campaign. What was the root cause of this entire investigation? Does it go back to September 2015 and the alleged Russian hacking? I really don’t know at this point. With this passage, Professor Turley pinpoints the real issue at stake: “I am truly concerned about our chances as a nation to emerge from this environment with an semblance of unity. There is little chance that we can resolve our divisions in this increasing polarized environment. An investigation of the Russia Probe, however warranted, will do nothing to heal America’s gaping divisions. And it’s ironic that Professor Turley feels stunned by our divisions after an appearance on Fox News. Fox News, more than any single entity, is responsible for polarizing America. Defenders of Richard Nixon (and the Vietnam War) strongly felt that if they had somehow controlled the message, Watergate would never have ended Nixon’s presidency. What’s more, the logic seemed to be that if Nixon had remained a strong president, South Vietnam would have survived the Paris Peace Accord. Nixon defenders felt they were reliving their nightmare when Iran-Contra engulfed the Reagan Administration. Therefore Fox News was launched with explicit goal of counter-spinning the mainstream media. The network would aggressively promote conservative talking points that appealed to angry Whites. But Fox never intended to ‘explore the issues’ by breaking-them down and analyzing components. Fox only sought to tell its viewers what they ‘wanted to hear’; simple narratives that supported simple talking points. Since Fox News debuted in the early 1990’s, the Republican Party has moved further to the right than any Social Scientist could have predicted. Republican senators who ‘used to’ represent the far-right are now considered ‘moderates’. In the 2012 Campaign, Mitt Romney felt compelled to identify himself as a “severe conservative”; a term that would have seemed absurd 20 years earlier. That was the Fox News legacy. But if the country was already divided when Trump entered the White House, Fox News has inflamed those divisions to a breaking point. This dynamic results from the fact that Trump is a devoted Fox News viewer. Everything Trump knows about politics he learned from Fox News. Trump’s total disregard for facts and science is no doubt related to his viewership of Fox. Trump’s relationship to Fox is so alarmingly close we now have what is known as a “closed loop feed” between the President and Fox. Several times since he took office, Trump has sent tweets, shifted focus and altered policies in response to talking point he heard on Fox. What’s more, Fox has had to perform acrobatics to support Trump’s false assertions. From an intellectual standpoint America has hit an all-time low. Sadly Professor Turley should not be surprised when an appearance on Fox News generates hostile emails. By lending his expertise to Fox News, and supporting their talking points, Turley links himself to Trump and everything Trump stands for; a toxic stew of lies. You sound like a rejected turkey. Maybe next Thanksgiving you will be on Turley’s plate. You need to do better than that Allan. That’s a childish ad hom in response to a thoughtful comment. Wildbill, That was a stupid statement Peter made. If you agree with it, I am sorry for you. Turley neither supports Fox talking points nor disagrees. He provides his own opinion based on his own beliefs. Turley doesn’t link himself to Trump rather he interprets the law. For the most part, I don’t think Tuley likes Trump. Thanks, Bill. It would have meant a lot to me to get Allan’s approval. But there’s something hard and unforgiving about him. Peter, perhaps unforgiving when stupidity can be avoided. Newsflash! People with borderline personality disorder are a key Democratic constituency. Ha, look at this comment thread, Nuchacha. Consider the nutty, racist bile posted by Trump defenders. You know who they are. They come out every day. Consider the nutty, racist bile posted by Trump defenders. The ‘nutty racists’ I’ve noticed are ‘Patriot’ (who recycles the same post over and over, and makes no mention of Trump) and ‘Squeeky Fromme’, and about her ‘Trump defender’ might be the fourth or fifth thing I’d notice. Do you include the Joo-obsessives on your ‘nutty racist’ list? Or do you refuse to include them because the three of them aren’t Trump defenders? Nutchacha, by the standards of this thread, you’re something of a ‘moderate’. But look at Rodney’s post. No one accused him by name, and he wasn’t even on my radar, yet he responds with pugnacious indignation. Rodney’s post is barely coherent. Rodney’s post was barely coherent and obviously racist. Is he a C V Brown sock puppet? He’s your fellow-traveler. Wear the shoe when it fits. No threats, P(r)issy, learn to discern. bile is necessary in human life to emulsify fat that you consume. Without it you would die. as for racist…..yawn…identity politics doesnt win elections, ask Hillary… which dovetails nicely to …. You weren’t on my radar, Rodney. But now you are; for all the wrong reasons. I respect that a lot more than an someone obsessed by and triggered by Hillary Clinton! why dont you just stone and beat all of us, “Peter Hill”, just like your ilk tried at Berkely and all of the other places where opposing views were offered? Lauren, ‘my ilk’..?? Like I’m not an individual but just ‘another leftist’..?? Like I have tow the ‘leftist line’ and defend Bernie Bros when I’m not defending Hillary? You have been acting like another “leftist”. I didn’t think so when I first encountered you but I learned differently. The discourse in this country is getting worst for sure, but who’s at the head of the parade? You lay down with dogs, you get fleas. For JT to be shocked into his senses, that we have a National embarrassment for a POTUS is beyond reason. I am very sorry that Professor Turley gets hit with a tsunami of hate male and calls when he makes an observation that benefits Trump. From my perspective, Turley criticizes and defends Trump depending on the facts of the particular situation. Anyone who would claim that he is either adamantly pro-Trump or anti-Trump has not read the breadth of his blog posts or interviews. That said, there is one point in which I disagree. Professor Turley pointed out that he gets complaints from all sides, depending on whether he stands on a Trump issue. That is true, and he is trying to be fair. However, there is not a parity in the problem. It is mainstream for Liberals to believe that Republicans are truly evil. There are factions that defend violence against opposing ideas, and they have power in universities across the nation, and indeed throughout the West. If you are a Conservative, then mainstream media and Hollywood believe you to be reprehensible. You may lose your job if you merely disagree with gay marriage or if you are pro-life. You could be driven out of business. Only Liberals may have their speakers on campus, as the high profile conservative speakers get harassed, threatened, and the universities will bar them from campus to prevent violence from Liberals. In UK, vegans are trying to force their minority viewpoint on the nation through harassment, vandalism, and violence (https://www.telegraph.co.uk/news/2018/05/27/butchers-living-fear-vegan-attacks-rise-says-countryside-alliance/). The alphabet soup of government has become infiltrated with Liberal activists, in the EPA, DOJ, FBI, CIA, IRS, NSA, and on down the list. Those activists have targeted conservative citizens and politicians, abusing their authority to try to enact a Single Party State. They have weaponized our government against its own people. Studies show Liberals are more likely to unfriend family and friends who are conservatives. If you are a conservative, you will be harassed by your teachers from preschool to graduate school, you will have to hide your opinions at work while others openly discuss theirs, you will be pressured to walk out of school to demonstrate, and you will watch Hollywood mock you in the majority of movies, and the mainstream media label you every evil attribute possible. I would not want the roles reversed, and the government and media to target Liberals. This is not the game we want to play in the US. As long as Liberals sincerely believe that Republicans are evil, there will never be calm, rational discourse on the tough issues. There will never be tolerance, and people will not get along. Making the claim that their political opponents were evil was a method to get votes and power, but there are those who actually believe it. Our wounds will not heal until Liberals stop thinking conservatives are evil, and we all gain tolerance for opposing viewpoints. Ms. Jerelyn Luther, Democratic voter. Is the Democratic Party really a party without a single fault? Extraordinary. There is not a single politician on Earth with whom I agree on all things. Your comment indicates that no criticism of the DNC is sincere or truthful. I don’t think Democrats are evil. I think that many Democrats sincerely believe that bigger government is the best way to help everyone. I disagree, and think there is danger in their approach well established throughout history. I think that shouting down or threatening conservatives has become accepted in the mainstream as fighting the good fight. There are historical consequences to this behavior, if you stop and think about it. I think there are other paradigms that produce better results, and the Republican Party also gets it wrong sometimes in regards to Big Government, high taxation, Constitutional threats, or mission creep. Karen, that rather famous Adlai Stevenson quote offended you? It was obviously said in a jocular manner, from a speech during the Presidential campaign of 1952. If you found offense in that don’t ever read up on Harry Truman it might give you the vapors! Karen, give us a list of great modern nations with small governments. Just name five, if you can. Five economic powers, with more than 50 million people, who have small governments. Peter, it would be useful to ask Karen to clarify what she means by bigger government. That way, in your question, one might better understand what you mean regarding small governments. Good point, Olly. Everyone has a different idea of what ‘big’ and ‘small’ government means. Ask 20 people and you might get 20 different responses. That’s why conservatives are vague when they say they want ‘small’ government. Because no one knows what small government really looks like. It’s like saying, “The TV networks should have more shows about normal families”. Well, what is a ‘normal’ family..?? ‘A normal family with guns in the house’? ‘A normal family with drugs in the house’? ‘A normal family with pit bulls as pets’? Millions of people might choose one of those three. Government can only be measured by ‘Bang For The Buck’. Or ‘What We Get For Our Tax Dollars’. Peter Hill – for me, small government is one like that under Roosevelt (Teddy not Franklin). Big government is now. Peter, to make the comment that the only way to measure government is by what we get for the money they spend, completely ignores the limits of what the constitution authorizes government to do in the first place. It is an Ends argument; completely ignoring the Means to provide it. For me, I don’t believe it’s a “big” or “small” issue. I believe it’s an issue of adhering to the federalism design, with each level of government doing only what the law authorizes. Decentralization leads to greater accountability. We may ultimately have “big” government, just not a centralized one. Peter, before I comment, please let me know if that last statement from you was intended to be taken seriously. Thanks for the movable goalposts. They’re … useful. Well, let’s see. Do I have to choose between Communist and Soviet Nations, the astronomically taxed France, UK, and the rest of Europe, including Belgium which is descending into terrorist chaos, the extremist and intolerant Middle East where you can be killed for blasphemy, Canada which has spirally healthcare costs and just enacted a law criminalizing the failure to use a myriad list of gender specific or non specific pronouns… We seem to be moving in the wrong direction. The United States enjoys the most robust free speech in the world. That is an advantage that is critical. For that, alone, we have a red line limiting government control of speech that a faction of voters is busily trying to overturn. Most nations experience mission creep of the government, from nanny state to dictatorships. Governments tend to become more and more bloated over time until and unless their citizens rein them back periodically. We were due for a reduction. I am rather close to Classical Liberalism, and believe in individual liberty for the most part. Karen, I am sure you have been following Tommy Robinson in Great Britain but if you haven’t, freedom of speech and some other rights seem to be quickly disappearing. My comment posted several items down was actually meant for you. My comment posted several items below was actually meant for you. Then maybe you should stop being evil. That’d be a good start. Speak out against white supremacy, blacks getting killed by police, starving the poor by taking away food stamps. A living wage for people. Money in politics. There’s so much you guys could do,but you don’t. Then maybe you should stop being evil. You’re admonishing a matron whose keeping Hallmark and gift shops in business and then career into sectarian rubbish. No one can help you. The people running Chicago are of your persuasion and black kids are being killed almost daily. You would think you would learn something from knowing that but you don’t seem to learn from experience. The truth is that people (perhaps like you) prefer their warped ideology rather than saving the lives of children. That is what is evil. Pointed out decades ago by Thomas Sowell that the Anointed aren’t interested in empirically verifiable results. See New York City’s fantastic success with crime control (and the less pronounced but real accomplishments in DC). Been met with pretty broad indifference most places, the Manhattan Institute excepted. Chicago has an amply staffed police force, but a homicide rate 5x that of New York. That’s what institutional lassitude and loser local politics gets you. These politicians were voted in by the ignorant and keep their positions because too many ignorant people never learn. I think emw is striving to be just like them. There’s no fight between good and evil here, that’s a childish way of looking at the world. Both parties consist of sinners doing their best in a fallen world. Wildbill, they may both be ” sinners doing their best in a fallen world” but best for whom, themselves or the people they represent? Can I point out that that among Republicans and conservatives the term liberal is used as if it were a profanity. I do not recall seeing the term conservative used by Democrats and liberals in a similar manner. Having said that I would like to take you at your word and have a serious dialogue with you. Please identify three to ten current issues and state your position on each. Also, please state your definition of liberal and conservative. If you are interested in my views you may want to take a look at three Amazon Kindle pamphlets. The pamphlets should be available for free May 31 through June 4. How interesting. I will take a look on Amazon for these titles. Thank you for the suggestion. I will get to the rest of your question tomorrow. Please define conservative and liberal as you understand these terms. I watched the entire interview on YouTube and find it amazing how far out some of the comments were. It is too bad that it has gone this far and we just can’t have a discussion without having a box of knives thrown at us.